The Lystrosaurus (Liss-tro-sore-us) is one of the Creatures in ARK: Survival Evolved. Lystrosaurus amicifidelis is a small herbivore, common to much of the Island. Only about two feet long, it is not high on the food chain, and eats small plant life. The Island's poisonous insects seem to have little effect on Lystrosaurus. Despite being among the Island's tinier herbivores, Lystrosaurus is an incredibly resilient survivor. It recovers its torpor and health much faster than most creatures, which makes rendering a Lystrosaurus unconscious a rather difficult affair. Not surprisingly, Lystrosaurus is an extremely loyal pet once tamed. It's a very fast learner, so it gains experience much more quickly than most other creatures. Additionally, its presence nearby appears to inspire allies, making them learn more rapidly as well. Thusly, Lystrosaurus is an excellent addition to any tribe's hunting party. The Lystrosaurus is passive. It will walk around aimlessly until attacked, at which point it will flee, albeit very slowly. 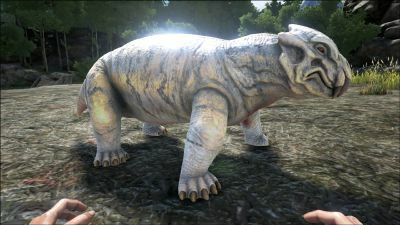 A Lystrosaurus will attack if the player steals its egg. The Lystrosaurus is a stout mammal-like reptile often described as resembling a reptilian pig. Like wild pigs, they are usually seen snuffling the jungle floor for food using two small canine teeth and a small but strong beak. The Lystrosaurus's only true defense is their stealth, being small and quiet makes them incredibly difficult to find. This section displays the Lystrosaurus's natural colors and regions. For demonstration, the regions below are colored red over an albino Lystrosaurus. 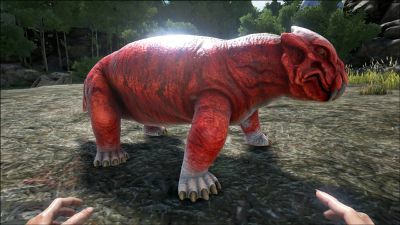 The colored squares shown underneath each region's description are the colors that the Lystrosaurus will randomly spawn with to provide an overall range of its natural color scheme. Hover your cursor over a color to display its name and ID. For example, "cheat SetTargetDinoColor 0 6" would color the Lystrosaurus's "body" magenta. The Lystrosaurus bites the target. Note: Although the DevKit has data for taming with Vegetables, the Lystro doesn't accept these as food. Lystrosaurus is tamed by hand-feeding rather than through the use of tranquilizers. To feed one you will need to place an appropriate food in the far-right slot of your hotbar and get close enough to the creature for the button prompt to appear. Lystrosaurus will take one piece of the food from your inventory and will play an eating animation. You must wait for the creature's hunger to go back down before it can be fed again, a process which takes some time, depending on the level and the food. This section describes how to fight against the Lystrosaurus. Killing a Lystrosaurus should be relatively easy and straight forward, comparable to fighting a dodo. Even a level 1 survivor can kill one with ease. Keep attacking it until it dies. The Lystrosaurus will attempt to run away, but it is relatively slow, and is easily caught up to. Any kind of weaponry will do, even your bare hands will do the trick. The Lystrosaurus has low HP and is slow, even when running. It will also not attack you when harmed, it will flee instead. While not a threat themselves, Lystrosaurus will typically share its environment with other carnivores like Dilophosaurs. Lower level players should keep and eye out for potential threats in the area before attacking. Nearby dinos receiving the Lystrosaurus' buff after being pet. 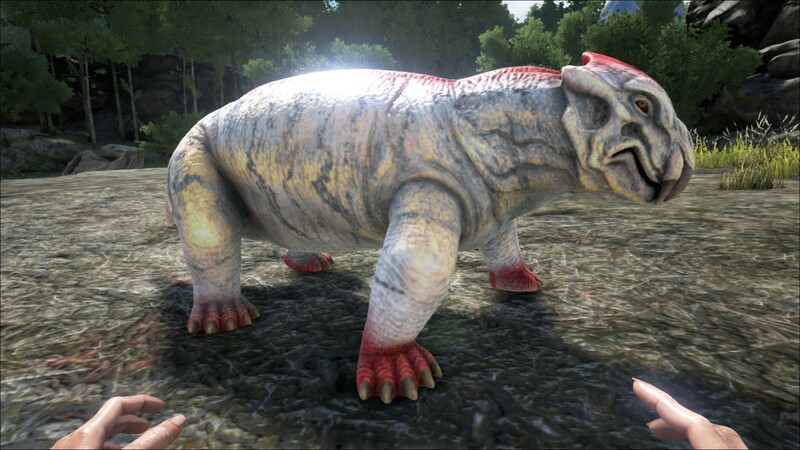 The Lystrosaurus' unique ability allows it to give tamed dinos an experience boost that lasts about 5 minutes. Simply walk up to and pet the Lystrosaurus to enable this buff. It will need to be pet again after the buff fades. For this reason, it's advised to have a Lystrosaurus follow you while you level up your pets. The buff multiplies all XP gains by 1.35. If you want to use the experience boost with a larger dinosaur, it's recommended to use more than one Lystrosaurus because the buff range will increase with each one. To boost a Bronto put the Lystrosaurus as near as possible to the Bronto's front legs. Another tactic is to use a Pteranodon to carry the Lystrosaurus. XP Booster: When pet, a Lystrosaurus will boost XP gains from all nearby allied dinos, including other Lystros. Egg Layer: Lystros lay eggs fairly quickly, which can be eaten, but the eggs can also be made into kibble for taming a Diplodocus or for Imprinting. The Lystrosaurus' name translates to "Shovel Lizard". This creature is small enough to pass Thatch Doorframe, Wooden Doorframe, Stone Doorframe, and Metal Doorframe (each including their doors). A Lystrosaurus can be knocked out however it can not be tamed if they are knocked out.